Preceeding the Mad Scientist Festival at the beginning of next month is the Frankenstein Chatbot Parade, a three day workshop (September 6-8) involving programming, textual data sources, creative writing and literary history - taking place at the Natural History Museum here in Bern. Chatbot coding is something I’ve tinkered with lately and am keen to support this initiative at the boundary of art, science and AI - hoping to join into the fray after brushing up on my Mary W. Shelley. Artificial intelligence can be as complex as it can be simple. With a small group of literary Python lovers we organise a workshop in the festival Mad Scientist in Bern. 200 years after Mary Shelly’s publication of ’Frankenstein; or, the Modern Prometheus’, we invite writers, artists, designers, programmers, and all people interested in literary chatbots based on or inspired by this gothic novel for three days of editing, writing and rewriting. We propose different ways to engage in the conversation around artificial intelligence. Using one of the oldest chat protocols (IRC) we invite participants to ’’read’ the bots, or rather, to go into dialogue with them, discover their reactions, scrutinize their feelings during the interaction. Secondly, they learn to write with some of the bots, by looking into their code, amending them to your needs and interests and who knows, reinvent an entirely new one. 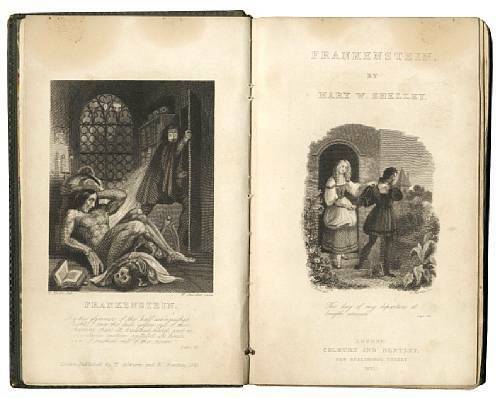 Finally, they are presented with ideas, works and reflections about the topic of artificial intelligence reframed in the dispositive of the novel: we’ll talk about Frankenstein the text, the inventor and the monster. The goal of the workshop will be the production of a new Frankenstein, a publication where the interaction between text, humans and machines is not fictional content but the result of a collective process executed using a ’hybrid publishing machine’ with joystick. The workshop is proposed by: Piero Bisello (art historian & writer), Sarah Garcin (graphic designer and programmer), James Bryan Graves (computer scientist), Anne Laforet (artist & critic), Catherine Lenoble (writer) and An Mertens (artist & writer). Information on registering is here. Let’s get franken-chatting!